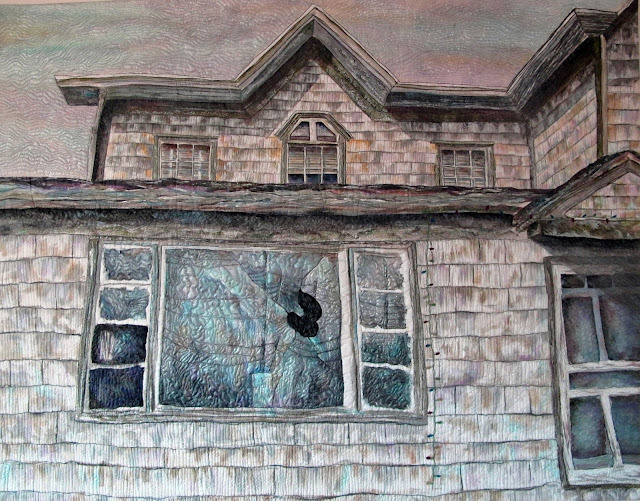 We’re so thankful to have Gloria Loughman returning for another fiber art workshop this year! Her workshop, The Textured Landscape, still has spots available and will run from August 26-September 1, 2018. 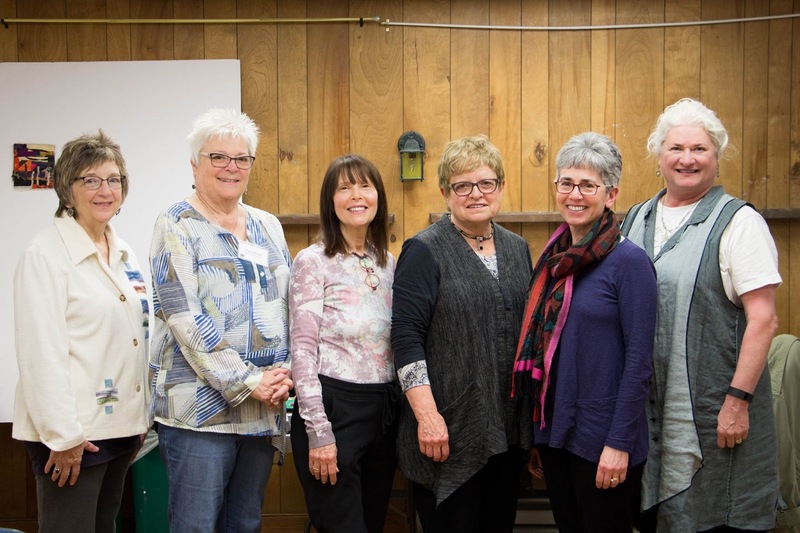 Well before her workshop and in fact, right before she left on a quilting cruise – Gloria took a moment to share more about her background and approach to art with us. GL: When I was growing up I like to play every sport available. I loved to run, climb trees, swim, sail and it never entered my head to sit still and paint or stitch. I actually failed needlework in year 7 when we had to stitch two samplers by hand and after that very negative experience I thought I would never attempt anything to do with sewing. After finishing high school, I went to University and trained as a teacher of mathematics and physical education. Later on I went back and studied to be a teacher of students with special needs. It was after the birth of our second daughter, my husband surprised me one Christmas with a gift of a Bernina sewing machine. He now maintains it was his ‘biggest mistake’ as I set off to make cute clothing for our daughters and later on formal dresses. 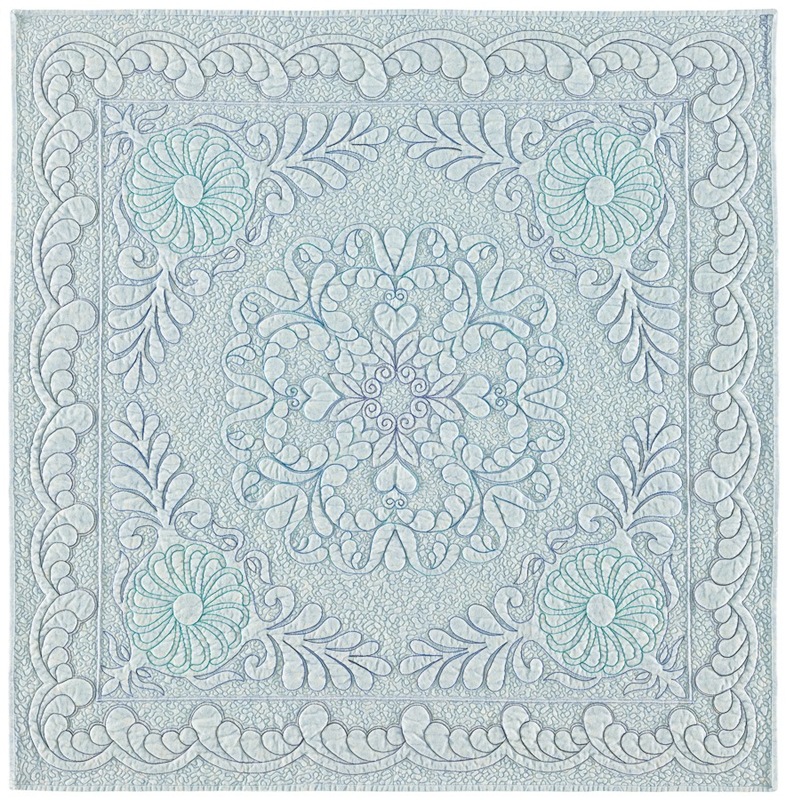 In 1988, I was diagnosed with breast cancer, still in my 30’s it was a tough time in our lives but as I was recovering from surgery and chemotherapy, a friend invited me to a quilting class. I loved the whole process. The precision cutting and piecing, choosing colors, fabrics and patterns, designing my own traditional quilts etc. 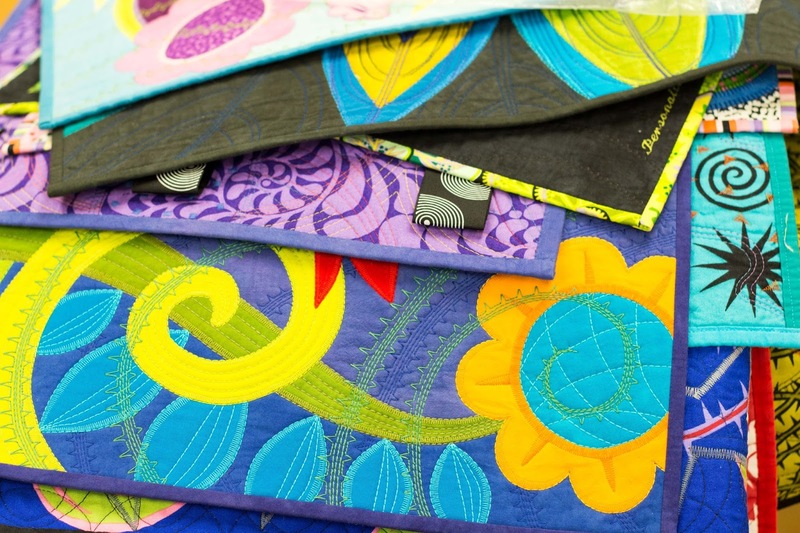 After making quilts for our family and lots of wall hangings, I became frustrated that I knew nothing about color or design so I enrolled in a Diploma Of Art which I did by distance education. It was a really busy time as I was teaching at school 4 days a week and busy doing my course the rest of the time. I had no time for making quilts. 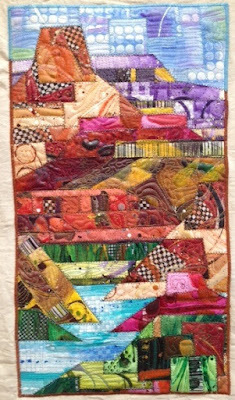 Once I had finished, I began making my large landscape quilts and then things have just progressed from there. What an incredible journey it has been!! GL: I tend to work on one project at a time although I am always thinking about the next one. I tend to work in a series whether it be technique or theme based. When I have been working on my books, I sometimes have more than one project on the go. So I am never short of inspiration and then it comes down to experimenting with a way of producing this image in fabric. I love art that is semi abstract and leaves the viewer filling in some of the spaces. This is what I am trying to pursue in my won work at the moment rather than reproduce a realistic copy of my inspiration. GL: I just love time in the studio and then I love sharing my techniques and ideas with others. I think I will be making art for the rest of my life and as I am nearly 70, I probably should stay home more and spend more time in the studio. Because I am away so much teaching classes and camping in Australia with friends, my time at home in the studio is precious and I value every minute of it. Sometimes it is just playing and other times it is working long days on a project. Always a treat!! 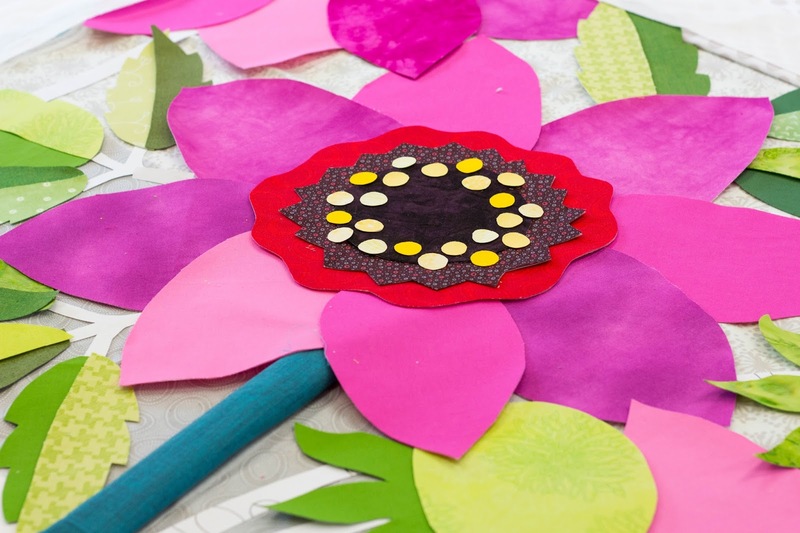 GL: I think the biggest risk I have taken was to leave my position as a team leader in a special school setting in a secondary school to teach quilt making. Our youngest daughter had just left school and we were supporting her at University in Melbourne. Financially it was quite a risk but after having breast cancer, my husband and I decided to take a chance and see how things worked out. It was a great decision. My husband is retired and usually accompanies me as we travel to so many amazing and beautiful places. We have friends from so many countries around the world and we even get the opportunity to host some of these friends at our home in Australia. We feel very fortunate. Learn more about Gloria’s workshop here. Find out more about Gloria on her website and give her a follow on Facebook. Another new addition to our fiber art workshops is art quilter and instructor Deborah Boschert! She’ll join us for a 5-day workshop from August 19-25, 2018 on creating art quilt collages with layers of fabric, paint, and stitches. Learn more about Deborah through our short interview with her below! Q: When did art first enter your life? DB: Oddly enough, my earliest memory is creating a Christmas ornament in pre-school. I must have been about four. We cut letter shapes out of construction paper, put them in some kind of plastic, then cooked them in the oven to seal the letter inside. I still have it and enjoy hanging it one the tree every year. I am delighted to say that I’m still cutting out shapes, but now I used fusible web and an iron to seal everything together. Q: Do you have certain themes in your work or subjects that reappear? DB: I do! Lately, I’ve been exploring bowls. They symbolize all the things we contain in our lives. Sometimes life feels like it’s overflowing and sometimes it feels empty. My art quilt collages are created with layers of fabric, paint and stitching, but also explore the layers of experiences in my life. I try to create art with a strong visual impact from across the room, but with several small, intimate details that the viewer can only appreciate upon close viewing. This is also like life — the big events are as important as the day-to-day routines. Other personal symbols I’ve used regularly in my art include ladders, houses, trees and stones. I also love to include handwriting as a graphic element. It suggests that there is a narrative behind the work. Every artist has a story to tell, an idea to explore or a message to convey. Sometimes it’s clear and sometimes it’s a bit more undefined. Q: If you could give one piece of advice to a beginning artist, what would it be? DB: Pull out some supplies, grab on to a bit of inspiration and begin! Just see what happens. As you create, think about what materials, techniques and ideas you enjoy working with, and continue with those. Use your head, heart and hands! Explore ideas that interest you. Use materials and techniques you love. Find techniques that fit your skills and ability. Q: What drives you to produce new art? DB: Well, what else am I going to do with all this fabric? Seriously though, I am always curious to see what I can create with different shapes, textures and fabrics. Usually it’s just a small bit of inspiration that eventually finds its way to a completed piece of art. It might be a song lyric, a scrap of fabric, or an interesting shadow. Q: What show, project, or event are you most looking forward to in 2018? DB: Besides five-days exploring art quilt collage at the Hudson River Valley?! I’m just beginning to think about creating some three-dimensional work. I may explore small sculptural pieces, or maybe vessels or possibly something related to the form of books. Also, I’ve joined a new yoga studio. I’m looking forward to lots of great, sweaty yoga classes! Learn more about Deborah’s workshop here. Find out more about Deborah on her website and give her a follow on Facebook, Instagram, Pinterest, & Twitter. 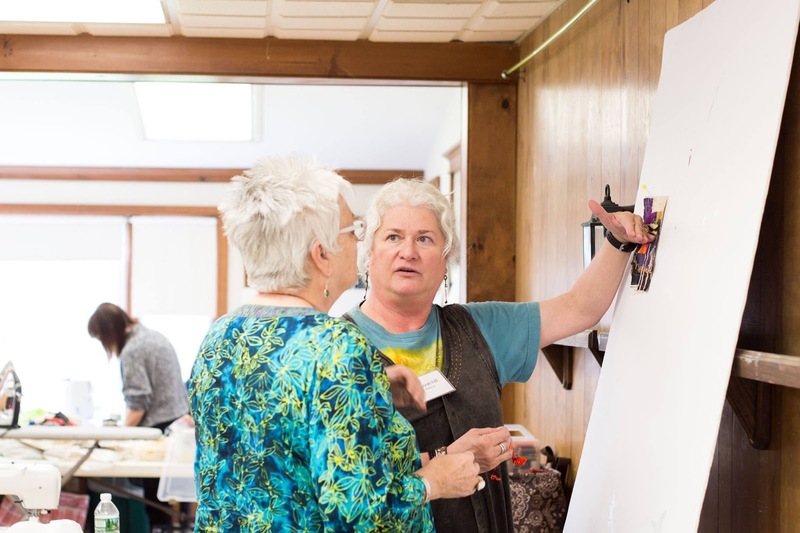 Fiber artist Esterita Austin returns to Greenville at the tail end of our season for a workshop exploring her original technique utilizing fusible web to transfer original painted imagery to Organza using metallic acrylic and textile paints. In preparation for her December 3-9, 2017 workshop, Esterita took a moment to answer a few questions about her approach to fiber art. Q: What do you want your work to do? EA: Inspire quilt artists to try a new expressive technique that can add new techniques to their quilt tool box. Q: How has your style changed over the years? EA: I started quilting making traditional quilts. After having taken a few art quilt workshops I began being more spontaneous and designed my own. I was still using cotton fabrics. Eventually I began using a variety of fabrics other than cotton, as well as using paint to further enhance my pieces. Eventually my pieces sequel into pure paint which I then transferred onto transparent organza. I have now found my niche combining painting and quilting. Sometimes it takes a while to find your voice and sing on key! Q: How do you come up with a profitable pricing structure for your pieces? EA: It’s just a gut feeling. I don’t want to price my work out of the market. If I want it to sell I will put a reasonable, or what I think is reasonable, price on it. EA: Technique is only a tool for expression. Q: Are involved in any upcoming shows or events? Where and when? EA: I have three shows going on now until mid June in Ohio in conjunction with QSDS and Dairy Barn. One is “Pushing the Surface 2017” at the Johnson-Humrickhouse Museum in Coshocton, Ohio. the other is “With These Hands” at the Ross Art Museum in Delaware, Ohio. Learn more about Esterita’s workshop with us here. Learn more about Esterita on her website. “Overall this was amazing from pre-registration through departure. Thank you for providing such a fun, affordable, challenging retreat. Jane will be hard to top! Jane is remarkably generous with her time, talent, and knowledge, She brought many of her wonderful quilts to show. She has a great ability to teach her techniques and inspire individuality. Great at giving, tips, help, and suggestions. 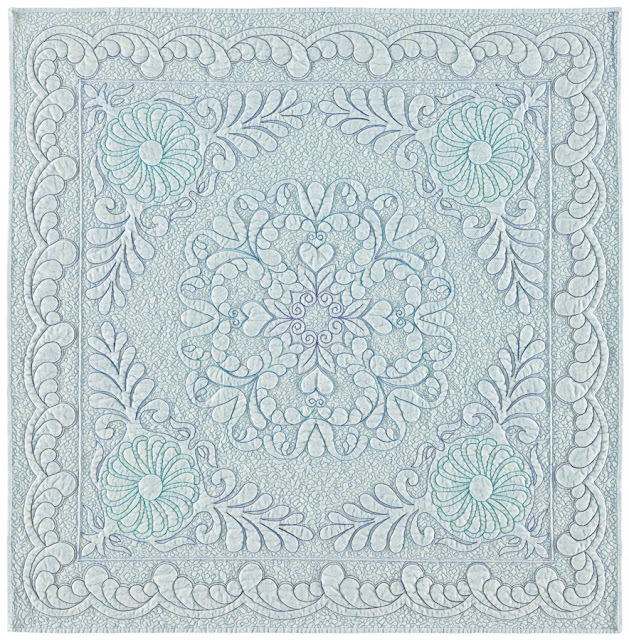 Instructing since 1988, quilt artist Sue Rassmussen will be joining us for a three-day workshop at the end of the year on Machine Quilting In Depth. From November 29-December 3, spend an immersive long weekend learning to create designs while quilting – and yes, we do have machines available to rent while you’re here! 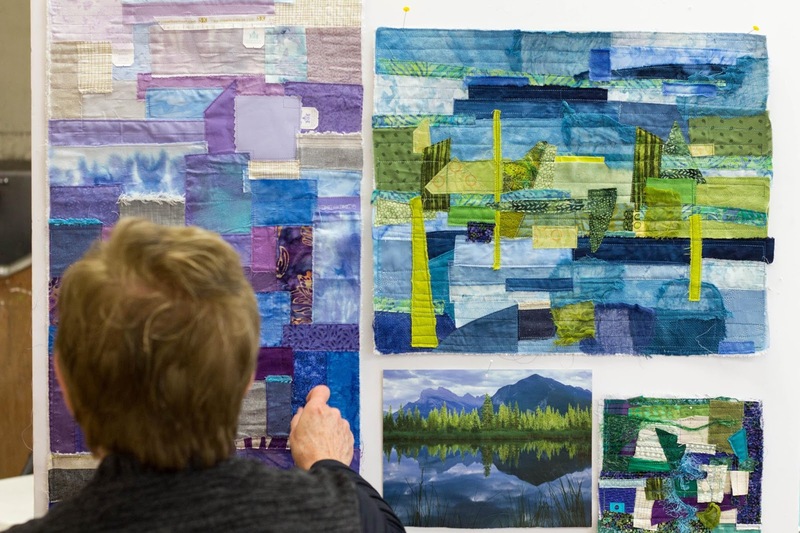 In advance of her workshop, Sue took a moment to fill us in on her approach to fiber art and a bit on her current projects. Q: Where do you draw your inspiration from? 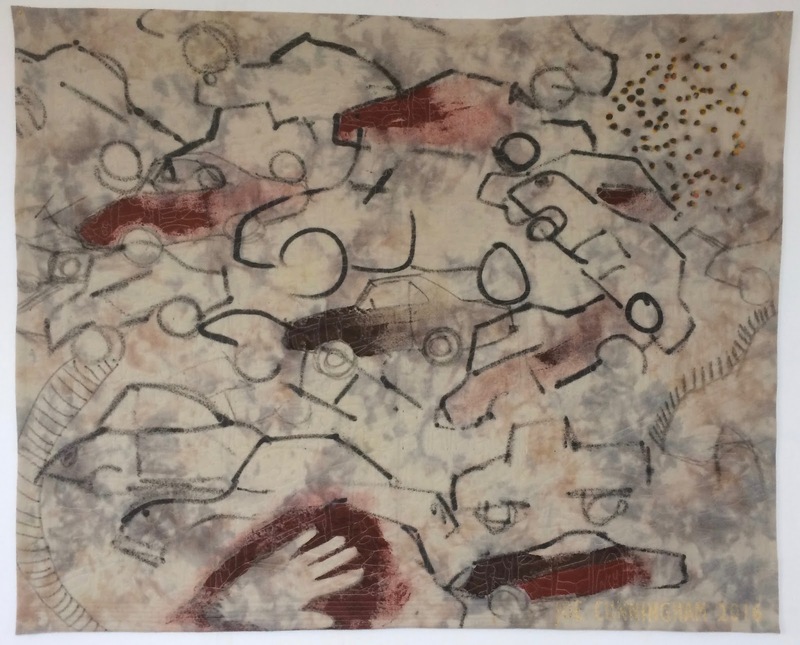 SR: I find inspiration for my quilting designs in textures all around me, from literally watching and drawing the movement of ants as they do their search for food to fissures in boulders to bark on trees. If we all take a minute to look around us, we will recognize that the world is filled with texture and designs. It’s only a snap shot away. A perfect example of this is several years ago we were visiting Yellowstone National Park. I asked my husband to pull over so I could take photos of the beautiful birch bark in the grove of trees. I must have been taking pictures for 10-15 minutes, and when I turned around there were five other campers parked, all crowding around my husband who was trying to explain that, no, there were no animals there but that I was taking pictures of the bark. None of them came to even look at the wonderful designs in the bark. Their loss! Q: What are you most proud of in regards to your art? SR: I love working with photos of animals (and flora) and transforming them into realistic (or not) quilts. I enjoy the machine quilting process because it adds a secondary layer to quilts which equals more interest and texture. Q: What are your biggest challenges to creating art and how do you deal with them? SR: I think finding more time, not getting sidetracked by the computer or the television, and believing that this is an important and justified use of my time. Q: What advice has influenced you? 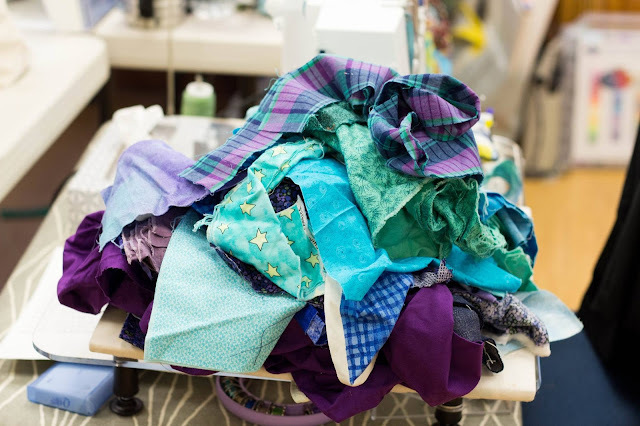 SR: One of my first teachers and now friend, Margaret Miller, once said to me “Why use one fabric when you can use five?” and then two seconds later said to me “why use only five fabrics when you could use twenty?” and from that moment on I have been shopping for variety of fabrics. Using a wide variety of fabrics in my mind just make the quilt more interesting and challenges me to think outside the box. Q: Is there something you are currently working on, or excited about starting that you can tell us about? SR: I have been collecting silk fabrics for some time and because I don’t generally use solid type fabrics, this is a bit more challenging for me, but fun! I am beginning a ‘landscape’ with these wonderful fabrics. Lately I have been moving into more art quilts and I love to just play with all my scraps to create a collage background to to do something with. Learn more about Sue’s workshop here. 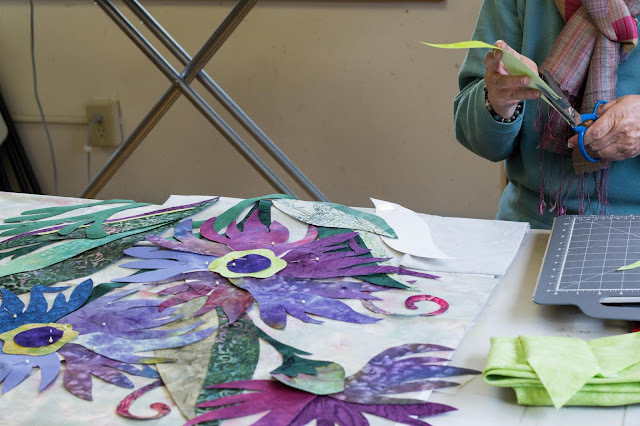 Art quilter Deborah Fell joined us for the first time a couple of weeks ago for a small but mighty workshop filled with the most creative uses of found and reused materials! One student even managed to reuse the wrappers from our soap bars and tea tags in her pieces. Coming to us all the way from South Africa in late autumn is fiber artist Rosalie Dace. From October 29th-November 4th, she’ll be instructing her workshop on African Cloths, Colors, and Quilts. In advance of her workshop, Rosalie was kind enough to share a bit more about her approach to art. RD: Inspiration is everywhere! I am in awe of the natural world and the richness it offers. How other artists respond fascinates me, whether they be painters, sculptors, weavers, writers, musicians, architects, or anyone else engaged in creating. Human experience and vision is always a source of inspiration. With this, comes the inspiration and expression of my own life. Q: What are you most proud of in regards to art? RD: That I have managed to create a body of work that reflects a personal history in textiles is amazing to me. Non of it existed before I made them. I am also proud, (and a bit scared!) of being involved in assessing other people’s visual work. I am proud of helping my students develop their creativity in the direction of their interest, and having them believe in themselves. RD: My biggest challenge is often the start of the work when I have to move from the excitement of the possible, and actually do the work. From there, the challenge is the battle of wills of what I think, and what the work wants to do anyway as it becomes itself and takes on a life of its own! Keeping going when I feel lost is always a challenge. Q: Is there something you are currently work on, or excited about starting that you can tell us about? RD: I am continuing work on a couple of different things that may seem unrelated at first (one on windows, one of maps, and plans among others), but they’re actually all about identity and place. Find out more about Rosalie’s workshop here. Learn more about Rosalie on her website here. Another new-to the Hudson River Valley Fiber Arts Workshops instructor this year is quilt maker Joe Cunningham! Joe began making quilts professionally in 1979, after a ten-year career as a musician in Michigan and will be teaching our students unique ways to use both piecing and appliqué from August 13-19, 2017 in his Subject to Interpretation workshop. To welcome him to our cadre of instructors, we asked Joe five short questions about his approach to art. JC: As a student and lover of 19th Century quilts, I draw a lot of my inspiration from them. But I also stay in touch with current events, and use them as thematic material. Ultimately, though, I end up using everything I have ever seen, thought, or felt as source material for my work. JC: I suppose the thing I am proud of is that I have figured out a way to make human-sized blankets that look at home on museum walls. JC: The biggest challenge for me, aside from pesky technical challenges that are always there, is to find a path in my work where I am not over-thinking it, and where I am not under-thinking it. I am trying to let the content of the piece express itself through me with a minimum of mediation, with a maximum of fidelity to my concept Sometimes it is hard to judge when I am veering off that path. Another way to say it is that my challenge is to stay open and free and true to my original idea. JC: Seeing in my artist’s sketchbook this quote: “If it looks like art, it must look like someone else’s art.” My wife, Carol LeMaitre, has helped me stay on track over the years by reminding me that I am not here to please anyone else with my work. William Wiley has told me that I don’t need to worry about anything by making my own work, whatever it looks like. JC: I am currently in the beginning of a new series of quilts inspired by the Clovis people of 13,500 years ago. They invented spear points so elegant and effective at killing mammoths and mastodons that they drove them extinct. Also I have just begun working on a book about my work of the last 20 years. Learn more about Joe’s workshop here. Learn more about Joe on his website or follow him on Facebook and Instagram. 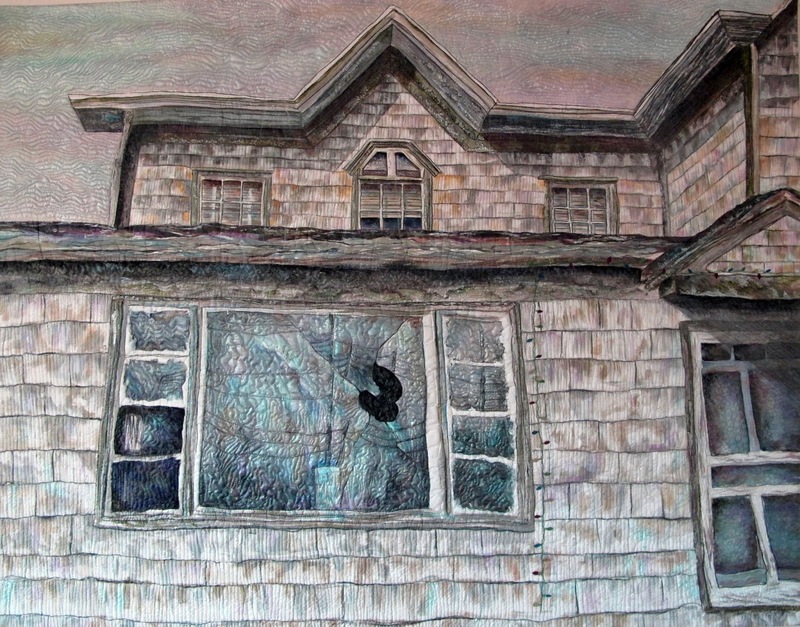 Instructor and author Katie Pasquini Masopust, known as Katie PM, will be returning to the Hudson River Valley Fiber Art Workshops program from June 11-17 for her popular Fractured Landscapes workshop. We still have a few spots available in Katie’s, open to all levels, workshop and so we’re happy to share more about Katie through our 2017 instructors interview series. KPM: I draw my inspiration from the landscape around me as well as from my paintings and photographs. KPM: I am proud of my work. I try to have strong compositions, inspirational subject matter, sophisticated color schemes, and good technique. I am proud of some of the awards I have won. The Silver Star at the Houston Quilt Festival, the Quilts Japan prize at Quilt National. My quilt, Rio Hondo, was chosen as one of the 100 quilts of the 20th Century. Q: What are your biggest challenge to creating art and how do you deal with them? KPM: My biggest challenge is getting time in my studio. I travel a lot to teach and write books and do many things that take up my time, but I am happier working on my quilts in my studio. KPM: Do the work. Keep working and coming up with new ideas and inspirations. KPM: I am working on a fabric line for Free Spirit based on my paintings that I am very excited about and working on a fiction book with my brother. A murder mystery where the clues are in the quilt, I made the quilt. 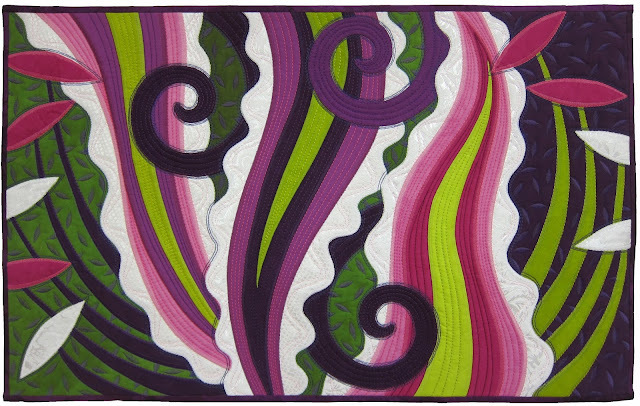 An image of Katie’s ‘Rio Hondo’ quilt can be seen in her online gallery here. You can find more details about Katie’s work on her website and follow her on Facebook. 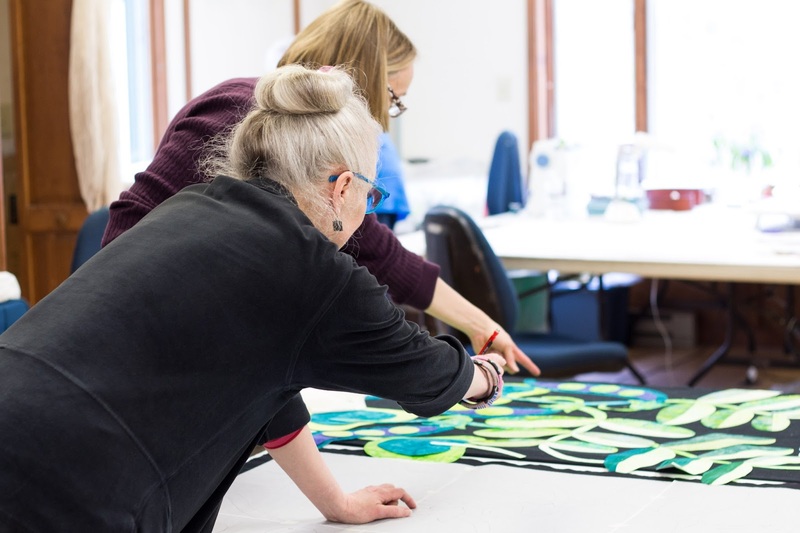 We couldn’t be more excited to be hosting another workshop with contemporary quilt artist, fabric designer, author, and teacher Jane Sassaman. Her April 30-May 6 workshop is entitled “Abstracting from Nature” and will focus on abstraction of flora and fauna and translating those ideas into fabric. With her workshop coming up at the tail end of next month (and yes, we still have spots available! ), we asked Jane five questions about her approach to art. 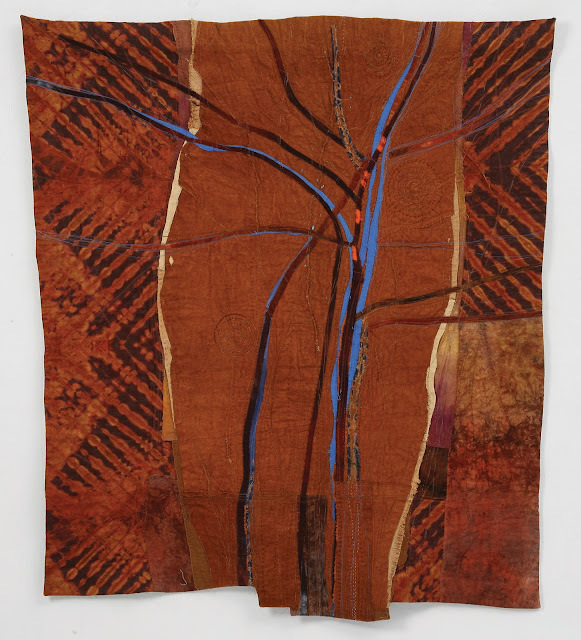 JS: Most of my quilts are symbolic statements about the cycles and spiritual forces of life. By using colorful fabrics cut into dramatic shapes, I try to express the energy and mystery of our amazing universe – from the miraculous beauty of a single blossom to the complicated powers of the soul. I want to snap us out of our mundane routine and remind us that we are part of the bigger “cosmic” picture. JS: Appliquéd collage has continued to be my method of composition. I love to play with shapes and let them react to one another. I am always looking for shapes that “speak” my language. Once I find a good shape it is always available, it becomes part of my dictionary of design. At this point, I have a nice collection of motifs that rotate through my work. The motifs are personally symbolic. A spiral, for example, is the shape of growth and movement, it is self- perpetuating. A dandelion is naive, innocently tenacious, a powerful life force. And fine craftsmanship continues to be very important to me. Good craftsmanship adds credibility and enhances the makers intent. JS: I have a price per square inch and then I add an emotional value. I’m not sure it’s really profitable (even after all these years) considering how energy intensive they are. But we have to give every piece complete consideration, no matter the time involved. It is amazing that the love and attention invested in a quilt is recognized by the viewer, often subconsciously. JS: This will sound corny, but I did a cross-stitch in 4th grade that said “Seems the harder I work, the luckier I get”. How’s that for a Midwestern work ethic? But it seems to be true for me. Good thing I LOVE to work… quilting and designing. Q: Are you involved in any upcoming shows or events? Where and when? JS: I am having a retrospective of my FreeSpirit fabric quilts at the AQS Shows in Lancaster, PA and Grand Rapids, MI this year. I have been designing Fabric for FreeSpirit for 16 years and it will be fun to share so many of the FreeSpirit quilts I’ve designer over the years. I am also having a show with the fabulous Betty Busby at the Visions Art Museum in January of 2018! Such an honor! You can find more details about Jane’s work on her website and also follow her on Facebook, Instagram, and Pinterest. Victoria Findlay Wolfe is an award winning quilter, fabric designer, international teacher and lecturer. Meet Victoria in this terrific video. You can also meet her in person later this year – Victoria will teach a fun three-day class, Lemoyne Star Through Play, November 30 to December 4, 2016 at the Hudson River Valley Fiber Arts Workshops. Victoria recently shared some thoughts on her art, and teaching. I’ve been teaching for four years. I first taught in Australia at Material Obsession. Kathy Doughty is a friend and asked if I would, so my family and I made it a big trip, and all went and enjoyed Sydney. I had so much fun, that I came back and started taking bookings in the US. I love watching people get the aha! moments! Watching their fear dissipate when showing them how simple all the things they say they would never do, actually are. When that “can do” attitude is found, the momentum then builds in their work, and is contagious to all around them. The power of a group setting is infectious! Learning a basic skill that you’re missing will make your projects so much easier. Learn a way to look differently at your process. Everyone needs a boot out of their own box once in a while. It’s good to shake up the way you work, to encourage more creativity. Confidence… Building your repertoire of ways to work, ways to see, ways to sew, enhances your output. Healing. I’ve been working on quilts that have a deeper message of healing, either about someone, or for myself in response to something, and pushing my own limits creatively. My Color Play is at the Texas Quilt Museum now in the Modern Quilt Exhibit, LaGrange Texas. A couple of quilts will be at QuiltCon in February, A few pieces will be in Gallery EOSS, March 17-April 16th. My Double Wedding Rings quilts are headed to Australia Quilt Convention, in April. A couple other shows and exhibits will be announced soon. Do you sell your work? I do sell my work, I sell privately, and do several commission pieces each year. I also donate a lot of quilts to my Community Quilt drive, BumblebeansBasics.com. I have a long rectangle shaped studio with windows on one short end. where my JUKI long arm sits looking out the window. The other three walls are completely covered in cotton batting, so I can work on 10-12 quilts at a time. All my machines and cutting station float in the middle so I can easily get all the way around my space. It’s wonderful! The studio is one building over from where I live, so I can easily close the door walk back home away from the mess! I keep one book case full of fabric in my studio. When it’s full, I stop buying fabric… I don’t need any more, and after not buying fabric for one year, actually found myself with four empty cubbies… So if you figure four cubbies of fabric a year for quilts, I’m still set for about ten years! I also keep an area to display small quilts that are inspirations to me. My Studio is my happy place, of course, so it must be filled with inspiration! I’m always working on new various large star variation quilts. The LeMoyne Star class is my favorite to teach, the possibilities are just endless! It is a great design to play, manipulate, and be intuitive with! My newest one was made out of Double Knit Polyester! haha! Bring old quilt tops that you haven’t finished, or leftover blocks to class, Let’s Play and turn them into new beautiful Star quilts!